It's been a while since I asked you to answer a few questions of my questionnaire. The one and only copy of my cookbook that I designed in the dark hours of the day was the prize to be won amongst those who did the questionnaire. The response has been great. The cookbook is on its way to Naomi Joffe who is still waiting for it, while Emirates Post and affiliates are handling the delivery (obviously very slowly). The questions that I asked came out of curiosity, to learn more about my regular readers and fans. On purpose, I did not include a recipe into this post. On purpose, I did not try and connect the questionnaire post to Foodgawker, Tastespotting, etc. I didn't want to advertise the giveaway as this usually draws a lot of random traffic too. I wanted to talk to mainly those of you who come to my site regularly, to see what you guys are about. Where do you find your recipes? Click to enlarge. Food blogs might be the obvious answer (especially when asked in a food blog), but I also wanted to see how the proportions are to other sources. You were given the choice to specify other sources too. Many of you commented that they would have liked to click all of the above. A few of you mentioned that they do their own creations. Question 2: How many cookbooks do you own? How many cookbooks do you own? Click to enlarge. You might want to know how many cookbooks I own? Not that many actually. Just went to count them. I've got 15 cookbooks, of which I use only 2 or 3 regularly. Question 3 : How often do you cook? How often do you cook? Click to enlarge. I wanted to see how many and to what extent the readers of Anja's Food 4 Thought rely on homemade food, an idea that I support with the recipes of my blog. 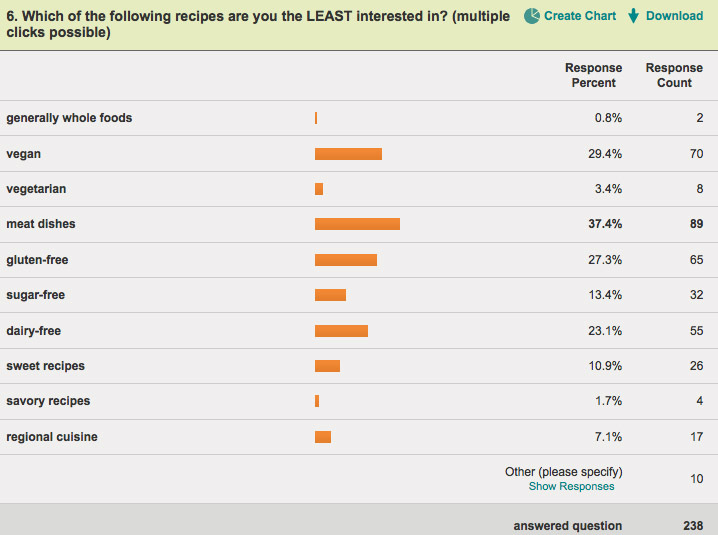 I agree with the majority here: I pretty much cook all meals everyday. Question 4: What meals do you cook the most? What meals do you cook the most? Click to enlarge. 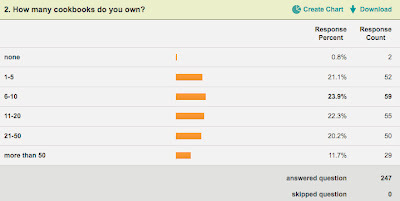 In other words, which meal is most often homemade in your house? Not surprisingly dinner, with breakfast and lunch far behind. 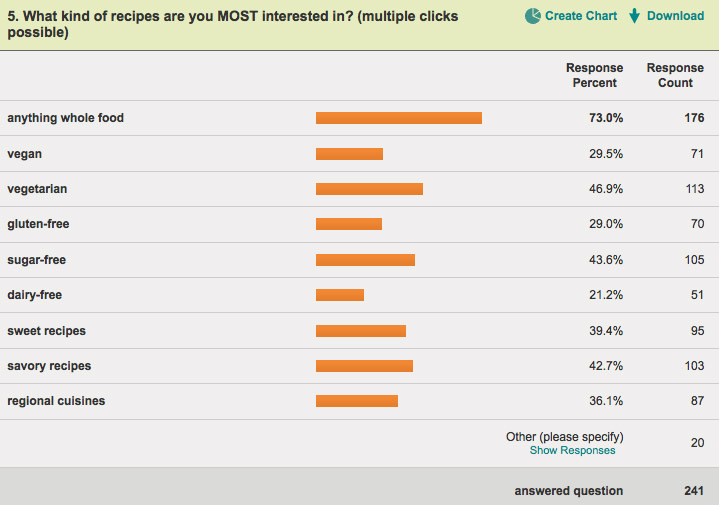 What's surprising here, is that sweet recipes are the most popular ones on my blog. I guess, that most people have a certain range of reliable dinner recipes that they cook regularly, whereas breakfast, dessert and snack recipes can be more of an experiment or are being bought from outside. Question 5: What kind of recipes are you MOST interested in? What kind of recipes are you most interested in? Click to enlarge. 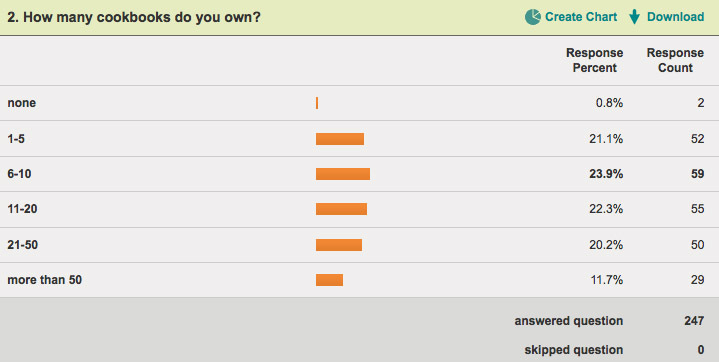 These are the answers of the readers of Anja's Food 4 Thought. It makes sense, as most of my recipes are generally wholesome, but don't necessarily follow a more specific diet. Readers could specify other recipes too, here is what was mentioned: ayurvedic recipes, spicy foods, raw foods, seafood, frugal eats, seasonal, eggless, low calorie, soy free. 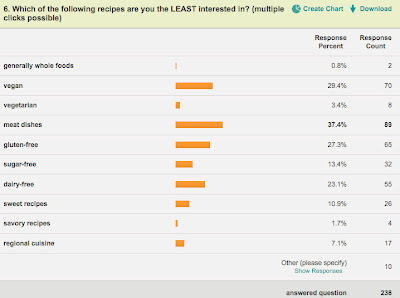 Question 6: Which of the following recipes are you the LEAST interested in? Which of the following recipes are you the LEAST interested in? Click to enlarge. It surprised me a little that meat dishes (no surprise really) was followed by gluten-free, dairy free, vegan and sugar-free dishes. Anyway, readers could specify other recipes too, here is what was mentioned as the least interesting recipes: red meat, wheat, gluten, time consuming, white sugar, white flours, box mixes, butter, fried foods, high fat, high sugar, beverages. Question 7: How long have you known Anja's Food 4 Thought? How long have you known Anja's Food 4 Thought? Click to enlarge. Almost 50% of you guys have known me for more than 6 months. That makes me very proud. Thanks for your faith. Question 8: What do you like the most about Anja's Food 4 Thought? beautiful photography, the running section, use of fresh ingredients, whole foods, creative ways of transforming recipes into something healthy, and recipes that work/turn out as expected. Question 9: How many recipes have you cooked from Anja's Food 4 Thought? 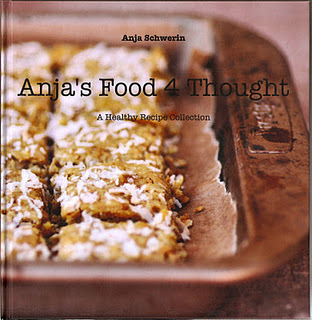 How many recipes have you cooked from Anja's Food 4 Thought? Click to enlarge. These results make me very proud. I couldn't name many blogs from which I have cooked 2-5 recipes. Thank you, guys. 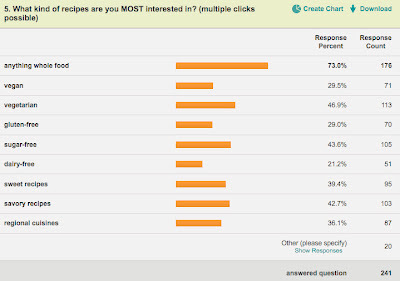 And more than 10% have tried more than 10 recipes? Unbelievable. 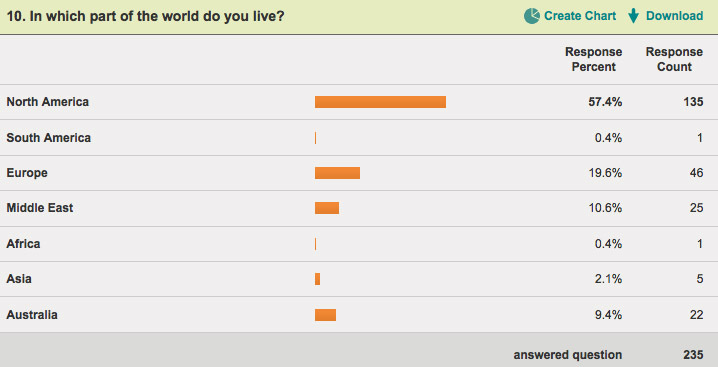 Question 10: In which part of the world do you live? 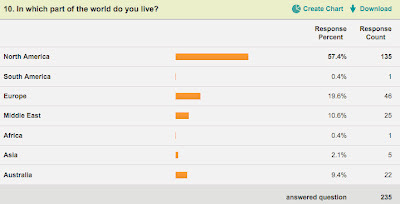 In which part of the world do you live? Click to enlarge. It may have seemed obvious, as I see most of my traffic coming from North America. I just wanted to check again with the faithful/regular ones. The answers here mirror where my overall traffic usually comes from.